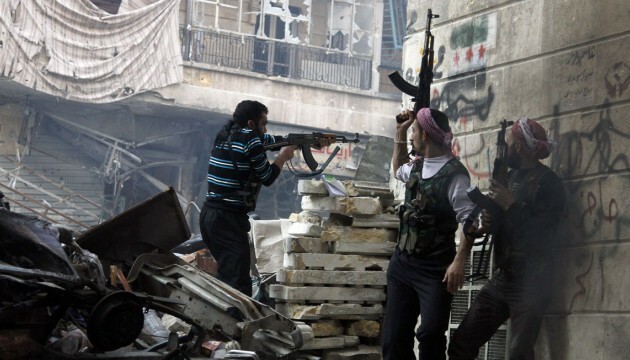 On the eve of the Islamic offensive, Syria had already suffered a considerably severe blow. It fell on Syria in the form of the global financial crisis which caused Syrian rates of economic growth to plummet from 5% to 2% by 2011. Although the losses were not critical then, it is evident that a decrease of even a fraction of a percent in this very important indicator would lead to the absolute figures growing exponentially. Meanwhile Syria experienced a decrease of over 50% and by definition could not quickly return to her anti-crisis conditions even if her other circumstances were more or less favourable. The situation is further exacerbated by the fact that these events transpired amid long-standing sanctions levied by the western powers against the ruling regime at the beginning of the 1980s. These anti-Syrian measures were not all-encompassing then, but they could significantly suppress development in a number of economic sectors. In 2012, the sanctions reached their pinnacle and essentially expanded into a blockade. The internal situation caused by these sanctions led to a serious deterioration of the economy by impeding the work of financial mechanisms while at the same time negatively affecting the oil sector. At any rate, the already modest oil production was severely curtailed (by a third) which led to a corresponding drop in income. This resulted in numerous other economic difficulties related to being unable to access technology, equipment, parts and other critical elements. The installation of these barriers dealt a palpable blow to all life support systems within the Syrian state, irrespective of the events that have presently caused the heaviest suffering for the Syrian people. The new wave of difficulties, this time in the shape of a colossal internal crisis, came in the form of a war with international bands of Islamists. The war led to a catastrophic collapse of the economy and the social sphere. Meanwhile, the scale of destruction grows as military clashes systematically roam from one location to another due to the absence of a continuous front line. This leads to the sweeping destruction of the infrastructure, engineering structures, housing and other property. Syria was not forced to overcome such trials since the times of Tamerlane, which now plainly threaten her abilities to be reborn again. The country was essentially shattered even without the widespread use of aircraft or ground vehicles. Numerous city blocks and villages have been practically levelled by hand-held weapon fire, which was not hard to accomplish when one accounts for the specifics of the local lightweight construction. It is not meant to withstand the destructive force of natural disasters, much less the sieges and the war of annihilation that are being conducted, as per tradition, within tight city blocks and crowded villages. It is difficult to imagine that all of this will be as easy to rebuild as it was to destroy. Moreover, it is not the rebuilding process itself that is intimidating, but the devastation that will follow after the war that is concerning, and it will require the long rehabilitation of the civilian population. Those forces that are interested in destabilizing the country will not be taken out of play immediately and will continue to traumatize the people and the Syrian society as a whole literally and figuratively. It is not very difficult to assess the scope of the damages: one need only look at the ruins. However, determining the exact scope of the losses in the present circumstances is a much more demanding task, and it is currently possible to only make estimates. That being said, the Syrian Center for Political and Strategic Studies has attempted to at least make a rough estimate of the results of the Syrian war and its cost to ordinary Syrians. The people were subjected to exceptional mass violence and persecutions on political and religious grounds. According to minimal estimates, a third of the country changed their place of residence one way or another. While there are no exact figures, it is still estimated that anywhere from 1.3 to 2 million people left everything behind to flee abroad from persecution in Syria, which is almost 10% of the total population. The same amount of people have also been said to have left the country “temporarily and voluntarily”. The intentions of the emergent masses of displaced people with Syrian citizenships with regards to their foreseeable future remains unclear. It also bears remembering that almost 2 million refugees did at one point move to Syria from Iraq. They settled into cities and villages, greatly increasing demand and inflating the prices for food and housing. Their fate presently remains uncertain while it is also unclear how many of them fled abroad within masses of Syrians. These figures make apparent the kind of devastation that befell the civilian population. It is estimated that, in light of the changes that have taken place, the human development index has been rolled back 35 years. The indicators roughly match those of the 1980s, which were fairly difficult years both for the country and its people. However, from around the 1970s, Syria did not have any beggars or homeless people as the family and clan ties did not allow for such things. Furthermore, the situation within the country allowed for people to have side jobs, which were widely popular and provided families with an acceptable level of additional income if the income from their full-time jobs was not enough. At the same time, the government also spent considerable amounts of money to subsidize the price of food for the needy. At present, the situation has drastically changed. The poverty threshold has increased considerably, now encompassing around seven million people while over three and a half million plunged into destitution. This is almost half of the population. This happened because 2.3 million jobs were destroyed and over 50% of the economically active population ended up unemployed, which reduced or completely cut off any means of livelihood for a great mass of people. Entire layers of the population must now survive by working at small-scale operations, bartering, resorting to odd jobs while not shunning any kind of work from anyone who can afford to pay for it. All of this is being widely used by the insurgents. It goes without saying that the government is unable to help on the same scale that it was able to before – the blockade and the war did their part. Consumer demand has fallen by almost 85% while the exchange rate of the Syrian pound against the U.S. dollar “slimmed down” by three times. Essentially, this degradation of the price index as well as the domestic currency exchange rate and the fragmentation of the supply and delivery systems are all linked with the weakening of regular monitoring by the government. However, exhausting the potential of manufacturing industries, curtailing the services sector and, of course, the destruction of the internal market as a whole, caused by the rupture of the intra-economic and inter-industry connections, have all contributed their fair share. The whole picture is further supplemented by factors such as the transition to autonomous life-support systems, more frequent power outages, malfunctions in water supply and the supply of fuel oil on the eve of the cold season. With all of these factors combined, it is even possible to talk about the country’s decentralization and the creation of very real preconditions for its disintegration into separate enclaves, as was observed in Lebanon during the years of their civil war. The armed opposition, represented by the militant elements, has been doing everything in its power to further aggravate the situation. The opposition is clearly abiding by the principle of “worse is better” and will stop at nothing to reach their goals. It is evident that the opposition is biding its time, waiting until the economic woes and social hardships, which are all presented solely as being the consequences of an uncompromising regime, force the masses to instigate armed rebellion against the regime in order to end their suffering, even if it means victory for the opposition. The radicals are happy with the collapse of the country and they are actively working towards this goal by shattering her unity, fueling religious antagonisms, destroying her culture and centuries-old moral environment. It is obvious they have serious hopes that the sense of universal hopelessness, violence and fear will gradually penetrate all pores of society to such an extent, that these feelings will completely eradicate any concepts of peaceful life from memory and will force the people to disregard the abyss that religious obscurantism and adventurism will drag them into. Syria has dangerously closely approached a frontier beyond which she may find a completely new life for herself. Although for now, the country is holding together. If we are to proceed from the realities of today, it can be assumed that Syria’s people are hardly ready to submissively accept the idea of turning the country into an Islamic enclave, even with the country’s current devastation and war. The Syrian statistics that register and confirm the realities of the present situation give the ordinary Syrians plenty food for thought with regards to the these possibilities. Alexander Filonik, Ph.D. in economics, Senior Research Fellow at the Center for Arab and Islamic Studies in the Institute of Oriental Studies at the Russian Academy of Sciences, exclusively for the online magazine “New Eastern Outlook”.